Astronomers have witnessed, in the finest detail yet, a brutal David-vs-Goliath fight between two nearby galaxies that are tearing chunks from each other and flinging them into the gaseous Magellanic Stream, a cosmic river of blood encircling our Milky Way. 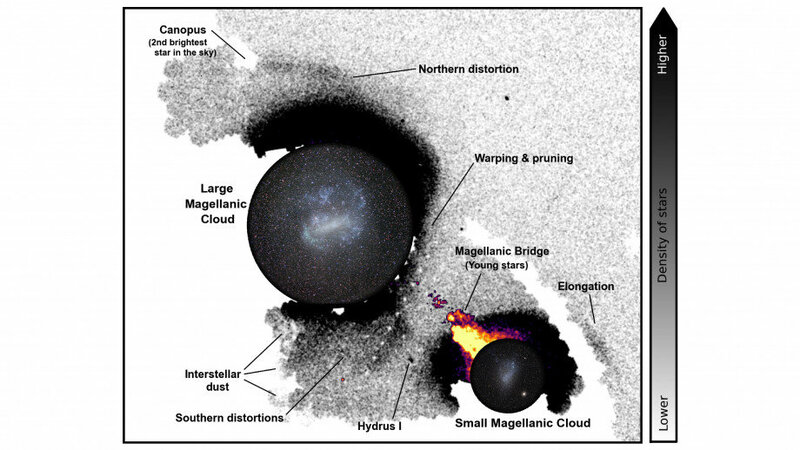 The new study led by ANU investigated the violent stoush between the Large and Small Magellanic Clouds—dwarf galaxies on the Milky Way’s periphery that are visible at night with the naked eye from the southern hemisphere. Lead researcher Dr. Dougal Mackey from ANU said the team created an ultra-faint map of stars in the outer edges of the Clouds using the Dark Energy Camera on the 4m Blanco telescope in Chile and revealed the Clouds have had repeated interactions with each other over billions of years. “This fight is a lot like the one that David and Goliath could have had if the little guy didn’t have such good luck with his sling shot,” said Dr. Mackey from the Research School of Astronomy and Astrophysics at ANU.